The women’s The North Face Sweater Custom Fleece Jacket is a soft, heather tone and adds casual appeal to the heavyweight, sweater-knit fleece jacket that’s warm, yet breathable. Perfect for all seasons! The men’s The North Face Tech Stretch Soft Shell Jacket is perfect for hiking, biking or commuting! The soft-shell Jacket is weather-protected with a breathable layer! Contoured to fit your body! The men's North Face ThermoBall Trekker Custom Jacket is lightweight, highly compressible ThermoBall powered by PrimaLoft synthetic insulation. Stops rain and wind to keep you warm and dry! The women's North Face Apex Barrier Soft Shell Custom Jacket is windproof with some stretch and a heavyweight soft shell! The women’s North Face Tech Quarter-Zip Custom Fleece Jacket is the perfect layering piece for spring skiing and early season hikes. It features a versatile, smooth-face fleece with a quarter-length zipper that lets you regulate temperature. The men’s North Face Tech Quarter-Zip Custom Fleece Jacket is the perfect layering piece for spring skiing and early season hikes. It features a versatile, smooth-face fleece with a quarter-length zipper that lets you regulate temperature. The women’s North Face Canyon Flats Stretch Custom Fleece Jacket is luxuriously plush and has plenty of built-in stretch for maximum movement and comfort. Perfect for all seasons! The women’s The North Face Tech Stretch Soft Shell Jacket is perfect for hiking, biking or commuting! The soft-shell Jacket is weather-protected with a breathable layer! The men’s The North Face Canyon Flats Custom Fleece Jacket will protect you from the elements at work or play with the sleek, smooth-faced fleece that offers durability and easy movement. Stops rain and wind to keep you warm and dry! The men's North Face Apex Barrier Soft Shell Custom Jacket is windproof with some stretch and a heavyweight soft shell! Wear this thermal vest as a mid-layer for added warmth! The women's North Face ThermoBall Trekker Custom Vest is contoured to fit your body and will maintain core warmth during winter excursions in cold, wet weather. The men's North Face ThermoBall Trekker Custom Vest is contoured to fit your body and will maintain core warmth during winter excursions in cold, wet weather. Wear this thermal vest as a mid-layer for added warmth! The North Face Custom Apparel is a retail brand that has gained in popularity due to its high quality promotional apparel. It all began with our world-class athletes. Their suggestions, recommendations and new equipment ideas provide the inspiration and challenges that drive the research and development for North Face outerwear! 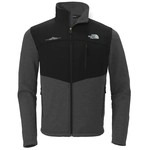 Order North Face logo apparel for year-end gifts and are also a great way to show your thanks and apreciation.